:'( | What Does :'( Mean? Nurse: Don't be alarmed. We've removed your legs, but there's good news: that guy wants to buy your sneakers. Wife: I've bought you some Viagra to test. Husband: Excellent! Let's give it a go. Wife: It's just to stop you rolling out of bed. 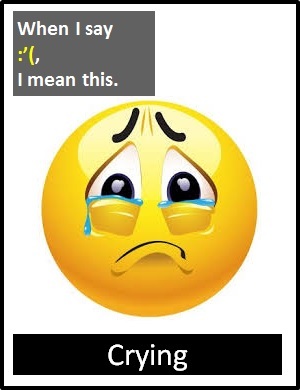 :'( is classified as an icon because it is a pictorial representation. Before the digital era, we might have said something like "I feel so sad" or "I am heartbroken" instead of :'(.